Beaumont Should have over $35 Million in their Fire Station Mitigation Fees Fund, but Beaumont has no Fire Station Mitigation Fund. Page 110 of the 2016/2017 Financial Statements is actual General Fund Expenditures compared to the Budget. In Fiscal Year 2017 the City of Beaumont planned to collect a total of $22.8 Million in Revenue and spend $28 Million. Magically; the City did collect $28 Million in Revenue but declared $29 Million in Expenses. The question is; where did the money come from and where did the money go? The City collected a Million more in Taxes than budgeted, $2.3 Million more in License and Permits, and a Million more than planned for Charges for Services. The City claims to have spent $5.4 Million from the General Fund for General Services, $12.5 Million on Public Safety, $2.9 Million on Public Works, $1.2 Million Community Development, $2.3 Million on Community Services, $4.2 Million on Garbage Collection, and another $1/2 Million on ‘Capital Outlay’ and paying on the $3 Million Fine from the State for Forging RDA Documents. The City once again claimed the $3 Million in Mitigation Fees from the Heartland deal that were also claimed as General Fund Revenue on the 2016 Audit. 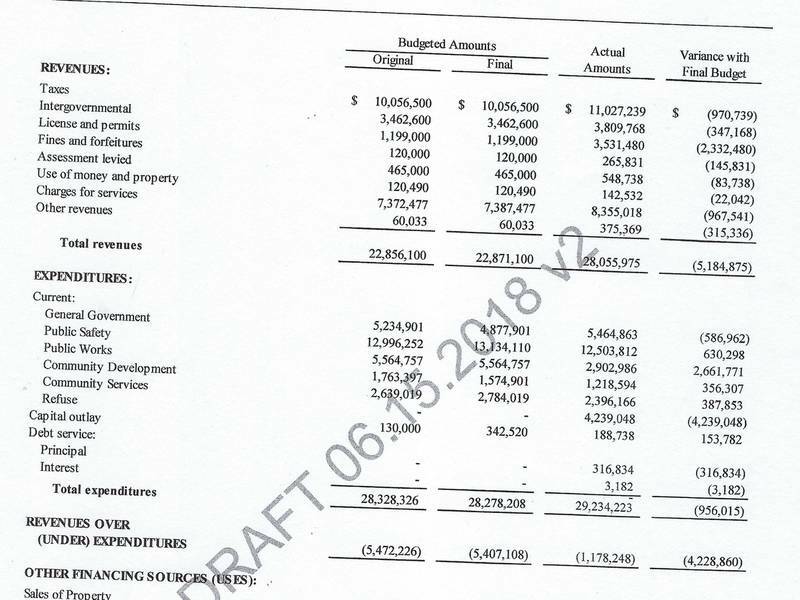 By claiming an additional $10 Million in General Fund Revenue the City claims to have a taken the General Fund Balance from a Negative $4 Million to a Positive $5 Million, which is the same claim made on last years’ Audited Financial Statements. Every year for the past quarter century the City has had $6 Million to $12 Million more General Fund Expenditures than Revenue. 2017 was not an exception. Beaumont should have over $35 Million in their Fire Station Mitigation Fees Fund. But there is no Fire Station Mitigation Fees Fund. All Mitigation Fees collected are deposited into the General Fund and spent on Lawyers and Consultants instead of building the City’s Infrastructure.